The Dan Jerusalem Hotel offers a premium hospitality experience that combines an idyllic environment with breath-taking vistas. Superbly designed around a series of beautiful patios, the Dan Jerusalem Hotel sits on the historic slopes of Mount Scopus, overlooking Jerusalem's romantic skyline and surrounded by the rolling hills of Judea. 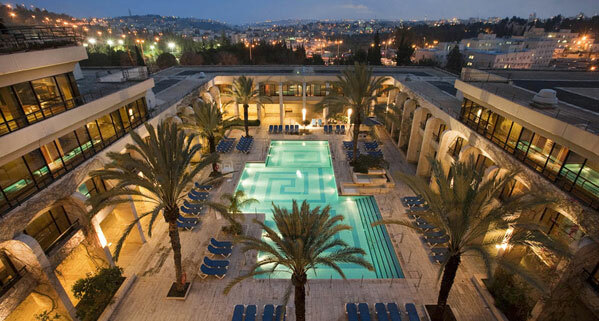 Located in a tranquil setting away from the city’s bustle, the Dan Jerusalem Hotel offers easy access to the Hebrew University’s Mount Scopus campus and the world-famous Hadassah Medical Center. Getting to the Old City is very simple - the Dan Jerusalem Hotel is located minutes away from the Jerusalem Light Rail that will take you to the center of town within about 15 minutes. The Old City is a picturesque walled city with a history that dates back over 3000 years. It is filled with religious sites holy to Jews, Christians and Muslims as well as unforgettable archaeological remnants. The Dan Jerusalem Hotel is also a perfect take-off point for a fascinating drive down to the desert. Within a half an hour you can be by the Dead Sea, which at 429 meters (1,407 ft.) below sea level is the lowest point on earth! For a memorable experience you can float on the water and to cover yourself with healing mud. While in the area,visit the famous Qumran Caves in which the Dead Sea Scrolls were found or explore the Masada fortress - a national symbol of Jewish freedom. Presidential SuiteA large, Spacious and tastefully decorated suite with great Old City Views. Very large living room area with adjacent private kitchenette. A spacious bedroom with a private walk-in closet, bathroom includes a Jacuzzi. The suites private balconies boasts spectacular views of the old city. Free access to King David Lounge (from age 18) More details: 104 Sq. m / Max 3 persons, Top Floor.